During tank blotting proteins are transferred in a vertical buffer tank between electrodes arranged on the sidewalls onto membranes. Tank blotting is recommended particularly for blotting of large molecules (> 100 resp. 200 kDa, depending on the proteins characteristics) or of proteins which are difficult to transfer with other blotting techniques. It is the method of choice also for native and temperature-sensitive proteins. Transfer can be done fast or overnight. Thanks to the higher buffer volume transfer times of more than 24 h can be realised, e. g. for gentle blotting of very big proteins. Different models are available: The highly sophisticated Tankblot for mini-gels offers the most effective cooling by the laterally integrated cooling jacket. Tankblot Eco-Mini and Tankblot Eco- Maxi are part of the modular Eco-Line and offer highly effective cooling of small and large gels by integrated cooling bases. 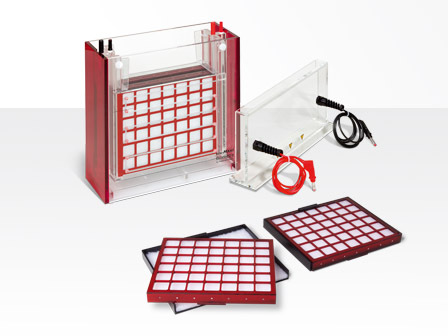 The Mini-V8·10 Blot Module is designed for use in the buffer tank of the Mini-V8·10 vertical gel electrophoresis apparatus. In the Tankblot a cooling jacket is integrated into the sidewalls. This results in convective chilling by circulation: the temperature is distributed more homogeneously (± 0.5 °C at 6 °C buffer temperature) than with other designs that use a magnetic stirrer circulating the buffer. 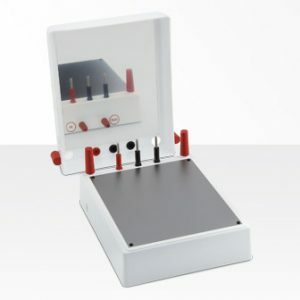 Additionally this special design prevents formation of ion gradients without the need for a magnetic stirrer. Depending on the selected buffer, transfer can be fast (between 30 min. and 4 h) or, under exceptionally gentle conditions, overnight (ca. 12 h). Thanks to the buffer volume of 1,200 ml long transfer times can be realised. Wire electrodes are placed on the side walls to provide uniform, reproducible protein transfer over a wide molecular weight range. The lower buffer chamber with built-in cooling base absorbs heat generated during rapid transfers and allows temperature controlled runs. A stir bar may be added to the buffer chamber to further improve buffer circulation and heat exchange. The colour coded blotting cassettes in combination with the colour coded connectors for the Bigfoot Safety Lid ensure accurate orientation of the gel sandwich during the transfer. The tankblot is available as stand-alone apparatus or as a module compatible with the buffer chamber EBC (with integrated cooling base) or EB (without cooling option). into powerful PAGE electrophoresis systems. Tankblot Eco-Mini is designed to transfer up to four PAGE mini-gels (up to 9.5 cm x 8.5 cm) in separate blotting cassettes simultaneously. loading into the blot module. Additional the assembly defends blotting sandwiches from squeezing. 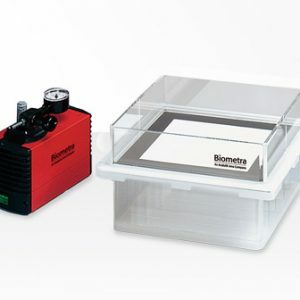 Tankblot Eco-Maxi is the large version for gel sizes up to 22 cm x 19 cm. The system offers the capacity of multiple transfers: several small gels or 1 large gel per cassette. Up to 2 large gels can be transferred simultaneously in separate blotting cassettes. The special design for fixing the blotting sandwich in the blotting cassette prevents squeezing and allows easy handling.